The little ones are well known for being calm, quiet and reflective. That is, when they are not jumping up and down and running around noisily. Sometimes others are inspired by their serenity and it helps them achieve their goals. 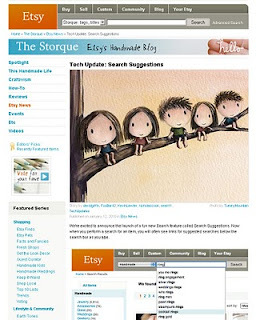 Some very technical people at Etsy have sought the wisdom of the little ones and this has helped them with their search engine. When The Boy has lost something (often his toothbrush), it is usually to be found in full view exactly where he just searched. Why is this? Maybe Wee Small is like The Boy. Wee Small does not move to look. If she does, it is with her mouth wide open and eyes shut. They appear open, but really they are shut. The Little Ones are far wiser than many grown-ups. Warning the butterflies that a storm was coming, for instance, is so reasonable I can't believe it isn't common practice. I would like to offer TummyMountain the lovely Sunshine Award, that was graciously passed on to me today and brought a big smile to my face. Please do stop by and pick it up. Thank you Beth. The little ones may need to make a guide book of their practices including the thunderstorm warnings amongst others.